The michigan 2015 Bass season is underway! The weather this season has lead to a later Spring with a near record winter and tons of snow, high water, and water temps well below the past several seasons. 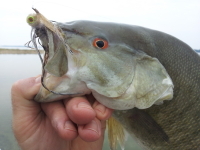 The local rivers are starting to drop, ice is off our big waters, and things are starting to heat up for the 2015 Smallmouth Bass Season. Grand Traverse Bay is weeks behind with a cold winter! Fish are on deeper drops and are starting to feed heavy! Look for fish to move shallow for the spawn in June, with shallow water fishing remaining good into July. Located in South Boardman, Michigan and having remote locations in Baldwin, Michigan and Newaygo, Michigan gives us access to dozens of the Midwest's finest "Blue Ribbon Trout Streams." Many of these Blue Ribbon Trout Streams offer year round opportunities for the fly fishing angler. Fly fishing for salmon, trout, and steelhead on Michigan's famous tributaries , and smallmouth bass & carp on the flats of Grand Traverse Bay is what we do best. Jon's Guide Service is a full service, year round fly fishing guide service. Our Michigan fly fishing guide service offers instruction and guided fishing on Michigan's Manistee River, Pere Marquette River, Muskegon River & more such as the Betsie River and Platte river as well as the AuSable River! 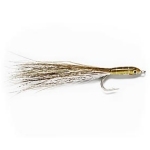 Jon's Guide Service provides fly fishing gear for trips and instruction on many of the major rivers in the State of Michigan, such as Winston, Sage, Simms, Cortland, Rio, SA. With a diverse set of guides located all over the state of Michigan, finding a guide for Western Michigan, Northern Michigan, Michigan's Upper Peninsula, or guided fly fishing on Michigan's Lake Huron and Michigan's Lake Michigan is not a problem, if booked in advance. Our fly fishing guide service and instruction are provided by FFF certified casting instructors, and guides who offer years of experience guiding Michigan rivers. Jon's Guide Service does everything it can to make your trip a fishing trip of a lifetime! 2). How we fish for Michigan trout in the spring. 3). 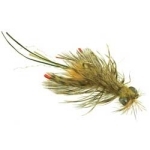 What flies should I fish for spring Trout? 4). When & Where to fish for Trout in Michigan. 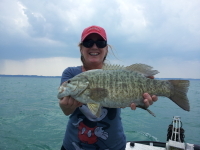 I have been a fishing guide in Michigan for over 30 years. Rivers such as the Pere Marquette, Manistee, AuSable and Betsie have been playgrounds and my office for many seasons. FFF certified casting instructor, Orvis endorsed guide and school instructor, Head Guide of the largest outfitter east of the Rocky Mountains, and fly shop owner have built years of experience in fishing & fly fishing Michigan waters and around the world. Join me and explore the great fishery and experience that Michigan rivers have to offer. My guide service is about providing a safe, educational experience that will be remembered for years to come. Our goal is to put you on the best fishing your day has to offer! Give a call ,e-mail or text. We would be happy to talk to you about guide trip options, rivers options, fishing experience, and what experience your looking for in a guided fishing trip. Let us make your next trip one to remember for a lifetime! Boardman River - walk-in trips, Urban fishery, Traverse City, MI. 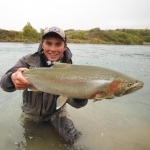 Muskegon River - Largest steelhead run in the state, and offers great fishing well into May! Contact us for preferred group pricing! These waters warm faster and offer shallow water opportunities sometimes weeks before the big waters. These smaller lakes are also our go to lakes when weather is not suitable for the big water. These smaller lakes also offer great summer top water action for smallies! 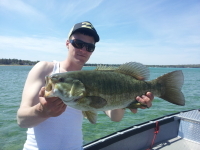 Grand Traverse Bay is a gem of a Smallmouth bass fishery! 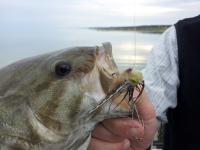 Smallmouth as large as 8lbs are caught on this large set of bays known as West and East bay. Water depth of 597 feet, and temps bouncing from the 70's down into the 40's can make fishing tricky! One of the best places in the United States for trophy smallie fishing for fish over the 5lbs mark. 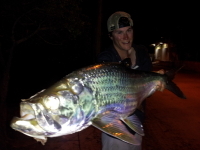 We offer both fly and light tackle trips for these trophy fish. 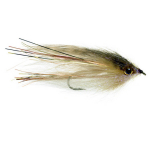 Fly fisherman are looing for smallies in the shallows in June, and gear fisherman cast to vast groups of pre spawn smallies on the drops early season in late May, and drop shot the deep weed beeds during the hot summer months. The big water has a great food source for these trophy fish in the Goby!! 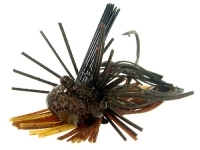 Crayfish and Bait Fish patterns and lures are also used. 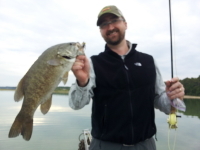 River smallies can provide a great opportunity for late summer fun on the river! 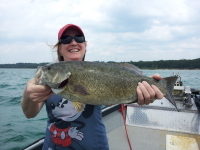 The Manistee and Muskegon rivers offer good to great fishing for smallies. Top water action is a norm late season, and these fish fight great on fly gear and ultra light gear. We guide out of a roomy 20' custom welded Jet driven boat. We can run shallow, and quite for working structure, and running on our local rivers during low summer flows. This boat is designed open to make sight fishing easy, safe, and fun! this boat also works great getting us into shallow flats for Carp and Smallie fishing on the flats of Grand Traverse Bay. 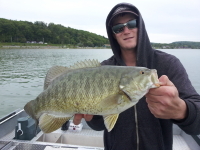 Taking bookings for Summer 2015 Smallmouth Bass fishing! 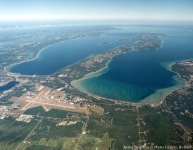 Traverse City "Top Ten Places for a Four-Day Vacation in the U.S."
Traverse City is voted one of the 10 Best Small Towns in America by Fodor's, Traverse City is a welcoming four-season destination that combines breathtaking natural attractions with a rich blend of adventure and relaxation. According to Bon Appetit, Traverse City is one of America's 5 Top Foodie Towns, offering the region’s best restaurants. Draft Magazine raves that Traverse City is one of the Top 3 Emerging Beer Towns in the USA with its microbreweries, distilleries and wineries. After indulging your culinary pleasures, climb to the top of Sleeping Bear Dunes, voted The Most Beautiful Place in America according to Good Morning America viewers.The glistening waters of Lake Michigan make a stunning backdrop as one of USA Today's 10 Best Great Coastal Drives. So relax and follow your compassTraverse City. Sometimes not only smallies bite!